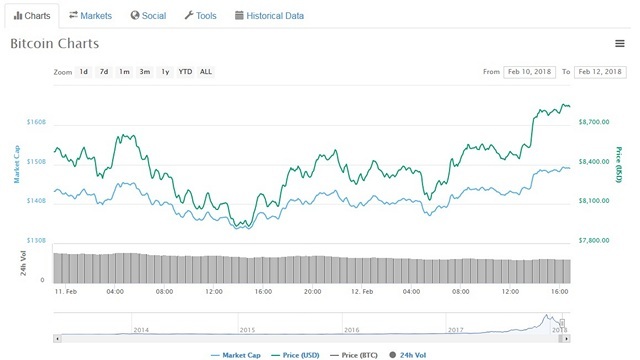 Amidst all the reports of an impending crypto-crash, Bitcoin and other leading digital currencies, like Ethereum and Ripple, have begun rallying back after an extended correction in the broader market that was spooked by talks of an impending crackdown by the regulators in many leading economies, especially in Asia. While China actually started putting its crackdown plans in practice, the Japanese, South Korean and Indian governments unsettled the market by reiterating that they do not consider digital tokens to be legal tender. After several weeks of downturn, however, cryptocurrencies are finally seeing a bit of a recovery, with Bitcoin trading at $8,789 on Monday, up 7.34 percent over the previous session. It’s still way below the highs of $20,000 it had hit a few weeks ago, but nonetheless, represents a significant recovery from the depths it hit earlier this month, when it fell below $8,000. In fact, Bitcoin even breached the psychological barrier of $9,000 earlier in the day before settling down around the $8,800 mark in another day of high volatility. Following in the footsteps of the world’s leading cryptocurrency, other major digital assets are also trading up, with Ethereum up 6.3 percent to $862.24, Litecoin up 6.2 percent to $158.14, Bitcoin Cash up 4.8 percent to $1,267.96, and Ripple is up 10 percent to $1.05. Worryingly, however, analysts still believe that the crypto-market is yet to get out of its long-term bearish trends.